Every big boss needs a desk. This one is a whole lot of fun! File drawers, shelves, pencil drawers, lots of desktop space, and grommets for tech. 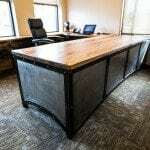 The reclaimed hardwood tops are colorful and organic looking and the steel gives it the industrial edge. The mix of cold rolled and hot rolled steel gives the metal contrast. 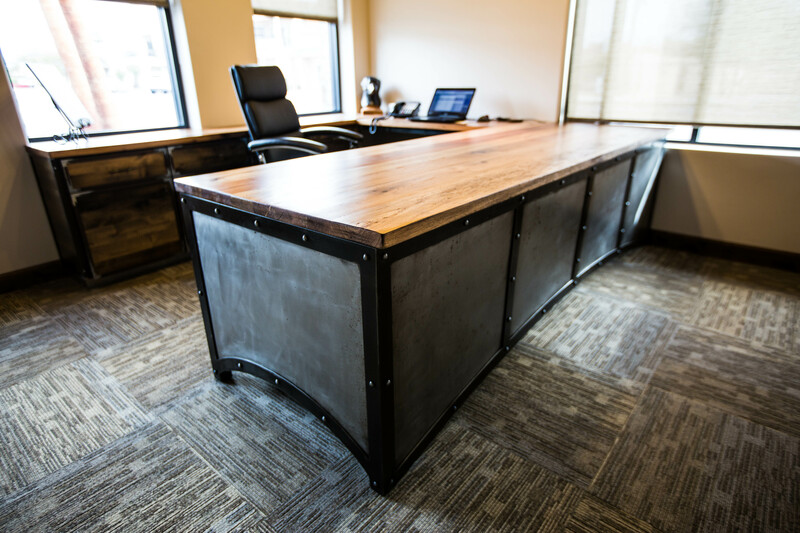 We used some boat hardware for the handles on the floating cabinet underneath the main desk, and distressed/blackened stainless pulls on the rest. The wood fronts to the cabinets are what we call 3-tone Yuma alder. 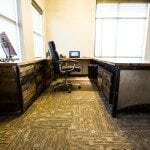 The color was very specific to this job and has a hint of grey in it. 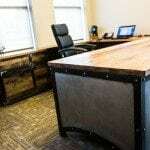 This is a very neat office space (Spencer Companies) filled with lots of Porter Barn Wood furniture and textures.